Aleshire (American Studies/Arizona State Univ. ; The Fox and the Whirlwind: General George Crook and Geronimo, 2000), begins his life of Cochise, the great Chiricahua Apache fighter and strategist, with an apology: because the conventional historiography of the 19th-century American West does not often allow for Native American voices, he asserts, he has had to use considerable invention in looking at Apache history from an Apache point of view. That’s all well and good, but Aleshire takes a few long stretches in recounting the eventful, violence-plagued life of Cochise (1804?–74), who had his hands full battling Mexicans and Americans while trying to secure a homeland that would be safe from intruders, while at the same time trying to rein in ambitious, bellicose compatriots like Geronimo. 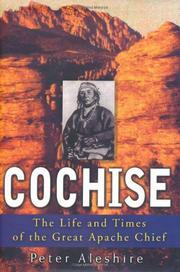 For one thing, Aleshire attributes to Cochise ideas and statements that no reliable history corroborates (“Cochise especially liked this story,” he writes at one point before relating a folktale gathered by an anthropologist in the late 1930s); for another, he tends to crib rather heavily from the ethnographic literature, and the best lines here are often those of writers such as Morris Opler, Eve Ball, and Keith Basso; for still another, Aleshire has an unfortunate habit of writing in a sort of noble-savage pastiche that’s thick with simile from the Chief Dan George school of Indian rhetoric (“Cochise felt caught in the midst of his enemies, like the deer who hears the echo of the wolves ahead and behind”; “He had steeled his heart, like a knife heated and quenched”; “Now Cochise’s heart leaped up in his chest, like an eagle lunging against a tether”). The surfeit of conjecture, sentimentality, and stentorian tone works, in the end, against Aleshire’s reliability as a narrator and historian, and it makes this a chore to read. Readers with a serious interest in Cochise’s life and times will prefer less self-conscious lives, such as Edwin Sweeney’s Cochise and David Roberts’s Once They Moved Like the Wind, to Aleshire’s imaginative treatment.